This is a graphgan and is worked with double crochet. I used Michael’s yarn when picking my colors, but you can pick whichever yarn is your preference. 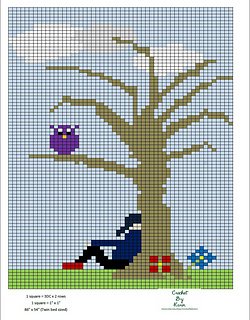 Please note, the final size will vary depending on what yard you chose - if you use the Michael’s yarn, the resulting dimensions will be around 86 x 54 inches, perfect for a twin sized bed.